Vancouver Pen Club: April meeting theme-- Stationery! Our next meeting is coming up soon, so here are the details! Time: 6:00-6:30pm "Meet & Greet"..... 6:30pm-8:30pm Meeting. Theme: STATIONERY--new, different & old standbys. 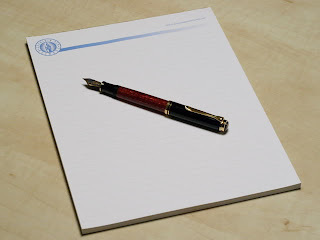 Please bring examples of the kind of "fountain-pen-friendly" stationery you use. As always, new pen-related acquisitions are our secondary topic. The photo above shows my trusty Pelikan M800 on a large notepad made exclusively for the Fountain Pen Network many years ago. It is wonderful paper for fountain pens (or any pens) and is one example I will be bringing to the meeting. The SPC has tentatively scheduled their April 16th meeting to be held in Bellingham, WA. Time & place: TBA (watch this space). VPC members are welcome and encouraged to attend! Just got an email update from the Seattle Pen Club that says due to various reasons their April 16th meeting will not be held in Bellingham.